After a brief mission to Libya, United Nations High Commissioner for Human Rights Zeid Ra’ad Al Hussein on Thursday said the Government “can and should” lead efforts to urgently address arbitrary detention, torture and other grave violations that must be brought to an end in the crisis-torn North African country. “No United Nations High Commissioner for Human Rights has ever made an official visit to discuss the human rights situation in Libya in the days of Muammar Gaddafi or in the years have followed the end of its dictatorial regime,” Mr. Zeid said in a statement issued by his Office (OHCHR) at the end of his mission. The High Commissioner travelled to Libya for one day, having not announced the visit in advance for security reasons. While there, he met with Libyan Prime Minister Fayez Serraj, the Ministers of Justice and the Interior, and the head of the department responsible for the management of migrant detention centers. Mr. Zeid was also able to make brief visits to one of the country’s major prisons and a camp for internally displaced persons (IDPs). “My trip was enlightened by a very useful meeting with Libyan civil society and women human rights defenders,” he said. Displaced Libyans and representatives of civil society met by the High Commissioner presented him with a clear picture of the serious abuses committed by armed groups and the impunity they currently enjoy. “The actions of armed groups are hampering significant progress towards stability, development and peace in the country,” Mr. Zeid underscored. While in Libya, the human rights chief also spoke with authorities about the alarming situation of migrants in the country. “I call on the Government to establish alternatives to detention in Libya, to put an end to the practice of arbitrary detention and to report on abuses committed against migrants in detention centers,” he stressed. Overall, he said that while the challenges facing human rights in Libya are “massive,” they are not insurmountable. At the same time, he recognized that the large-scale collapse of the judicial system, power and influence of armed groups and the many challenges facing the Government are very real. “But the Government can and should lead. It can begin to combat the practice of arbitrary detention and to take back the powers conferred on armed groups. The situation in detention centers can be addressed,” Mr. Zeid stated, stressing that a concerted effort by the Government and all stakeholders, including the UN and the international community, can change and improve the situation. 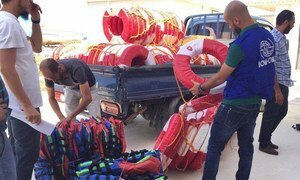 The United Nations migration agency is working with Libyan authorities to help rescue more migrants off the Libyan coast.